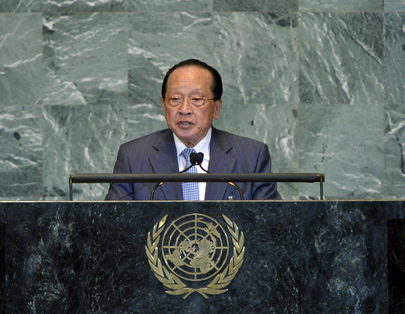 HOR NAMHONG, Deputy Prime Minister and Minister of Foreign Affairs and International Cooperation of Cambodia, said the fragile global economy faced three major challenges — sovereign debt, slow growth and social instability — and required the implementation of a wide range of policy responses and overdue reforms. The crisis had reaffirmed the importance of global economic and financial governance reform, including strengthening the role of the International Monetary Fund (IMF). He said Asia had become an essential partner in the global economy and taken the lead in advancing recovery efforts, pointing to Cambodia’s expected 8.7 per cent growth rate for 2011, which rose after declines in 2008 and 2009. Although significant successes had been achieved in attaining the Millennium Goals, most developing countries, particularly least developed countries, continued to face huge hurdles on the path to reaching targets. Continued economic and financial instability, persistently high fuel oil prices, worsening food security and the burden of debt repayment were major challenges for the least developed countries. For its part, Cambodia was accorded the Millennium Development Goals Award 2010 by the Millennium Development Goals Award Committee in New York for its outstanding achievement of Millennium Goal 6, to combat HIV/AIDs, malaria and other diseases, he said. Turning to environmental issues, he said climate change was becoming a constant threat, as drought and flooding had become more severe and frequent. He regretted that many promises made during the Copenhagen and Cancun meetings of the United Nations Climate Change Conference remained undelivered. The coming Climate Change Conference, in Durban in November, should not be another delusion, he said, but a venue to share the responsibility and to achieve a real breakthrough for facing climate change challenges. Cambodia had successfully launched the Climate Change Alliance to strengthen national institutions. His country was also implementing numerous projects within the framework of the United Nations Programme on Reducing Emissions from Deforestation and Forest Degradation in Developing Countries (UN-REDD). Food and energy security were also major issues of global concern, with high fuel prices remaining volatile. Perhaps it was time to consider establishing a world body comprising major producers and consumers of fuel oil to ensure a reasonable price limit. A more holistic approach than the current one would be the transfer of relevant knowledge and technology to assist developing countries in exploiting alternative sources of energy. A balanced approach should be taken, he said, to address the “twin problem” of food and energy security. Cambodia was doing its part by intensifying rice production and trying to establish an association of rice exporters that, among other things, would contribute to stabilizing the food market and preventing speculation on food prices.